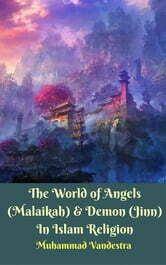 In common folklore, angels or malaikah are thought of as good forces of nature, hologram images, or illusions. Western iconography sometimes depicts angels as fat cherubic babies or handsome young men or women with a halo surrounding their head. In Islamic doctrine, they are real created beings who will eventually suffer death, but are generally hidden from our senses. They are not divine or semi-divine, and they are not God’s associates running different districts of the universe. Also, they are not objects to be worshipped or prayed to, as they do not deliver our prayers to God. They all submit to God and carry out His commands. In the Islamic worldview, there are no fallen angels: they are not divided into ‘good’ and ‘evil’ angels. Human beings do not become angels after death. Satan is not a fallen angel, but is one of the jinn (demon), a creation of God parallel to human beings and angels. Angels were created from light before human beings were created, and thus their graphic or symbolic representation in Islamic art is rare. Nevertheless, they are generally beautiful beings with wings as described in Muslim scripture. Angels form different cosmic hierarchies and orders in the sense that they are of different size, status, and merit. The greatest of them is Gabriel. The Prophet of Islam actually saw him in his original form. Also, the attendants of God’s Throne are among the greatest angels. They love the believers and beseech God to forgive them their sins. Throughout history humankind has been attracted to the supernatural. Spirits, ghosts and many other strange creatures have filled our minds and captured our imaginations. Strange and beguiling spectres have at times lead people to commit the greatest of all sins – Shirk. So are these spirits real? Are they more than just figments of our imagination, or shadows moulded from smoke and illusion? Well, according to Muslims they are very real. Spirits, ghosts, banshees, poltergeists and phantoms can all be explained when one understands the Islamic concept of spirits – the world of the Jinn (Demon). The Arabic word Jinn is from the verb ‘Janna’ and means to hide or conceal. The Jinn or Demon are so called because they conceal themselves from people’s sight. The words janeen (foetus) and mijann (shield) come from the same root. Jinn or demon, as the name suggests, are normally invisible to humans. The jinn are part of God’s creation. They were created from fire before the creation of Adam and humankind. Jinn (Demon) exist in our world but they live on their own. Jinn have their own distinct nature and features and they generally remain hidden from humankind. Jinn and humans do have some common traits, the most important of which is free will and with it the ability to choose between good and evil, right and wrong. The jinn eat and drink, they marry, have children and die. Who Is Allah SWT God In Islam Religion?